Back at the Allwine Prairie sweating to death - and struggling to find much to photograph. The grass is over 6 feet now. Humidity super high. So I did a lot of sweating and waiting. And all of a sudden there were all kinds of spiders doing their thing. As evening approached they were fast at work spinning their webs. I decided to give it a try - I went with a back lit approach. 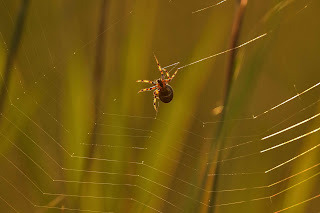 The sun was lighting up their legs and web. Kind of cool.